How Loud is That Gong? 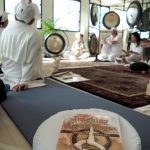 Most people experience the sound of the gong as “loud” even when played at a medium volume because of the power and complexity of the sound it is capable of producing. And if the gong is played poorly, it sounds even louder because of the discordance. 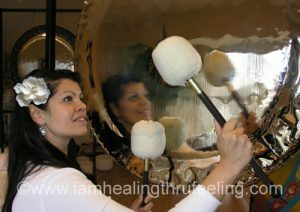 Add to this that the most common fear people do have about the gong is that the sound may somehow damage their hearing. So we do need to truly be able to answer the question: How loud is the gong? Loudness is measured in decibel levels (dB) which ranges from 0 dB, the softest sound you can hear, up to somewhere around 200 dB, about the sound of a rocket launch. Would you believe that the loudest a gong can be played is about half-way between the sound of a butterfly wing moving and a Titan missile? Well almost. I’ve measured the decibel level of a gong as would be experienced by the gong player or someone within 3 to 6 feet of the gong. At my most insane pounding (purely for scientific purposes), I was able to reach 105 dB and that took a lot of effort which can only be done for a very very short period of time. Even while playing at a level I could sustain for a minute, it was difficult to get to 102 dB. Most of the time the sound level was somewhere between 80 to 97 dB. So how loud is that? Comparable sounds at those levels include a washing machine, busy city traffic, a hair dryer, a lawn mower, and finally a motorcycle. Louder sounds than that level include a leaf blower, rock concert, chainsaw, and then getting way beyond the gong, an ambulance, jack hammer and jet plane. We all agree that most players make sounds more attractive than a chainsaw. At the lower gong volume levels of 85 dB, you would have to be exposed to the continual sound of the gong for 8 hours for any hearing damage to occur. At around 95 dB, the exposure level is one hour (I doubt if anyone has played a gong at that sound level for one hour!). If you somehow could play as loud as 105 dB, you would have to maintain that level of intensity for about 6 minutes before any damage would occur. And you have to be within 6 feet of the gong. And that would mean you were actually attempting sonic torture instead of playing the gong. The bottom line: the gong is not too loud. But please play well. My Favorite 26” Gong … This Month! Every gong is different and it isn’t easy to say that you have a favorite gong. But for fun, I’d like to use this column to explore (almost every month), my favorite gong based purely on its size. So keeping in mind that we are only looking at 26” size Paiste gongs, which is my favorite? Unlike last month when we had five 24” gongs up for consideration, Paiste only makes two gongs in the 26” size: Symphonic and Earth Sound Creation. The 26” Symphonic is a great travel gong and still small enough to be used as a hand-held gong for short periods of time. Like all the symphonics, it has a wide and variable range of sound and is said to be “non-tuned;” that is, it is not tuned to a specific frequency but has a variable sound range that is unique to each gong. You don’t usually see too many 26” Symphonic gongs as many players who want a small gong will go for the 24” and those who want a small to mid-range gong get the 28” symphonic. But the 26” is a good small size gong. The 26” Earth Sound Creation gong is another animal altogether. All the Paiste Sound creation gongs (and there are four sizes, 26”, 32”, 38” and 60”) have the unique hammered appearance of being dimpled all over and without the definitive center circle that the other Paiste gongs possess. They are darker in color yet really reflect rays of light in an amazing way when in low light environments. Play one by candlelight and see what I mean! 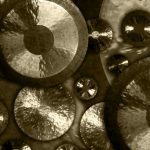 Like the Symphonics, the Sound Creation gongs are also “non-tuned.” They have a very lively “splashy crashy” sound that can overwhelm if you play them too hard, yet they produce a sound that is so mysterious and definitely different than the other gongs. Beginners like them because all you have to do is lightly tap them and they respond quickly. I say they almost play themselves. However, they do require some subtlety in playing and may not be the best first gong for a new player. 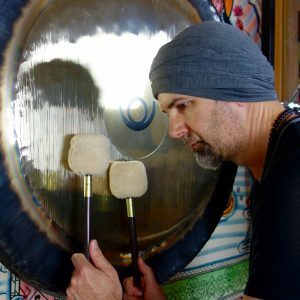 If you play a Sound Creation gong like a Symphonic, it can be overly challenging to the listener. 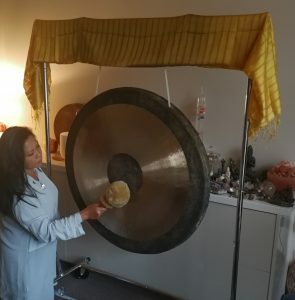 I absolutely love the 26” Sound Creation as a second (or third or fourth …) gong to play in contrast with your other gongs and it’s an excellent gong for therapy. While it is significantly more expensive the 26” Symphonic, you will feel like you own something very special – and you do! My favorite 26” gong (at least this month): Earth Sound Creation Gong! Gongs – The Universal Language! 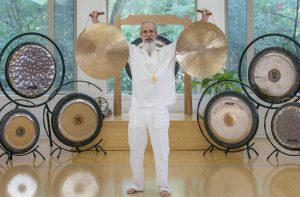 Mehtab has been playing the gong since 1974 and has trained yoga teachers, therapists and musicians around the world in the art of playing the gong. 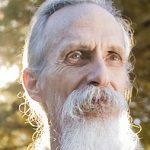 He is the originator and author of Gong Yoga, the first book on using the gong in the practice of yoga and has since written two additional books on the gong; Teaching Gong Yoga: Theory and Practice and Gong Therapy: Sound Healing & Yoga. Mehtab has taught Kundalini Yoga since 1974 and has trained hundreds of Hatha and Kundalini Yoga teachers. 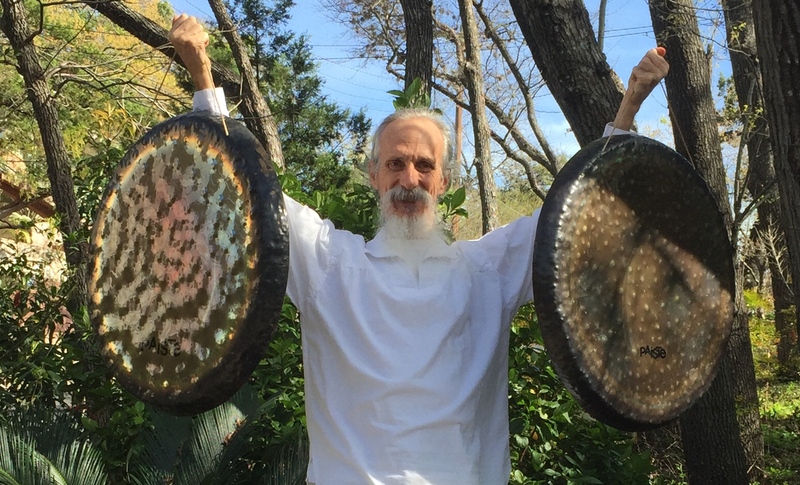 He was a featured instructor in the University of Texas Master Class series where he played the gong and lectured on the practice of yoga. A certified Vedic Astrologer and trainer, Mehtab also offers astrology readings for clients to help them in their selection of Planetary Gongs.